16 tracks: Jeannie Robertson ‘MacCrimmon’s Lament’ * Jimmy MacBeath ‘Tramps and Hawkers’ * Jean Redpath ‘Auld Lang Syne’ * Willie Scott ‘Jamie Telfer of The Fair Dodheid’ * Dolina MacLennan ‘Tha Mi Duilich’ (I Am Sorrowful) * Davie Stewart ‘McGinty’s Meal and Ale’ * Aly Bain (with Ale Möller) ‘Hector The Hero’ * Belle Stewart ‘The Berryfields of Blair’ * Allan MacDonald (with Seudan) ‘Thogail nam Bó’ (MacFarlane’s Gathering) * Willie Scott ‘The Kielder Hunt’ * Jimmy MacBeath ‘Drumdelgie’ * Flora MacNeil ‘Mhic Iain ‘Ic Sheumais’ (Son of John, Son of James) * Belle Stewart ‘Queen Among The Heather’ * Jeannie Robertson ‘The Battle of Harlaw’ * Hugh MacDiarmid ‘The Watergaw’ (poem) * Hamish Henderson ‘The Freedom Come All Ye’. In August 2017 the painting Scotland’s Voices by Alexander (Sandy) Moffat MBE was unveiled in the Saltire Society Rooms, Edinburgh. The painting imagines some of the influential singers, players and tradition bearers of the Scottish folk revival, assembled round the poet, folk song collector and pivotal figure of that revival, Hamish Henderson, deploying his trusty tape recorder. The image is set in the 1950s when Henderson and other collectors were making their first, revelatory forays into the song-rich territories of the traveller encampments, bothies, Hebridean crofts and many other situations where traditional songs, story and music, widely presumed to be in extremis if not actually extinct, were found to be alive and kicking. It was Henderson who described his endeavours to record the oral culture of the travellers as like “holding a tin can under the Niagara Falls”. Back in 1980, Moffat, one of the most distinctive portraitists and a former head of painting and printmaking at Glasgow School of Art, had produced his now famous canvas Poets’ Pub, which normally hangs in the Scottish National Portrait Gallery. The painting captured key figures in the Scottish literary renaissance, with the likes of Norman MacCaig, Sorley Maclean and Edwin Morgan clustered around the presiding genius of Hugh MacDiarmid. A few years ago, Moffat’s friend, the filmmaker Douglas Eadie, suggested to him that he paint a counterpart, this time portraying some of the salient figures of Scotland’s folk, rather than literary, revival. Reluctant at first, Moffat gradually became enamoured with the idea. Many of the often larger-than-life characters inhabiting the painting are no longer with us, while one or two are from a more recent generation. Working on the painting, Sandy Moffat spent a lot of time listening to recordings of them and talking to those that had known them, as well as to those who, happily are still very much with us. It’s worth noting that, unlike the exclusively male domain of the Rose Street Makars, clustered in their shadowy howff, Scotland’s Voices includes four powerful, tradition-bearing women. The challenge was accepted by Greentrax and Ian Green invited Jim to be involved in selecting the tracks and writing the sleeve notes for such a milestone compilation, to which he enthusiastically agreed, while Sandy Moffat was asked for and generously gave his permission to allow the image of the painting to be included in the design of the CD front cover. 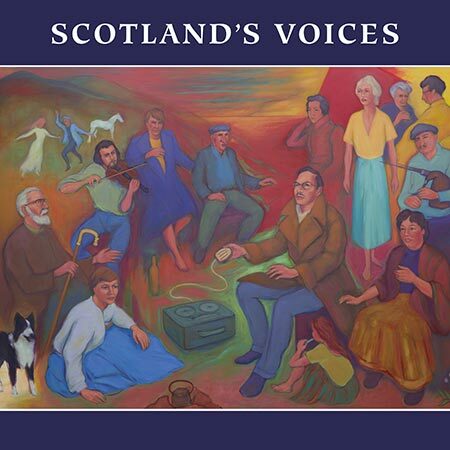 The album includes tracks by the monumental Jeannie Robertson MBE (MacCrimmon’s Lament and The Battle of Harlaw); matriarch of The Stewarts of Blair, Belle Stewart MBE (The Berryfields of Blair and The Queen Among The Heather); bearing a wealth of Gaelic song and originally from Lewis, Dolina MacLennan (Tha Mi Duillich); the Border Shepherd, Willie Scott (Jamie Telfer of The Fair Dodheid and The Kielder Hunt); King of the Cornkisters, Jimmy MacBeath (Come All Ye Tramps and Hawkers and Drumdelgie); the internationally renowned revivalist Jean Redpath MBE (Auld Lang Syne); Shetland’s ambassador for the fiddle, Aly Bain MBE (Hector The Hero); and one of the three piping MacDonald brothers of Glenuig, Allan MacDonald (Thogail nam Bó). We also thought it appropriate to include a self-penned track by Hamish Henderson (The Freedom Come All Ye) and a short poem from a key figure in the painting, Hugh MacDiarmid (The Watergaw). We’ve also included tracks by two singers not in the painting but who were approximate contemporaries of those portrayed: the internationally renowned exponent of Gaelic song, Flora MacNeil (A Mhic Iain Ic Sheumais) and the irrepressible Davie The Galoot Stewart (McGinty’s Meal and Ale). Interestingly, the Jeannie Robertson track The Battle of Harlaw, from The School of Scottish Studies archives, was recorded by Hamish Henderson at one of his famous ceilidhs - live recordings do of course have their own challenges. Davie Stewart’s track McGinty’s Meal and Ale was recorded by the American collector, Alan Lomax. Ian Green especially thanks Sandy Moffat for the generous use of the painting image and Jim Gilchrist for his considerable contribution in the research and preparation of the album. Thanks also to the following, without whose support, this album would not have been possible: Topic Records, Rounder Records, Temple Records, Whirlie Records, Dolina MacLennan, The School of Scottish Studies, The American Folklife Center and Carcanet Press/PennSound. Design is by John Slavin of DesignFolk, the album was mastered by Peter Haigh of Pier House Studios, and most of the text here is from Jim Gilchrist’s outstanding sleeve notes. Part of the Landmarks exhibition with Scotland’s Voices opens in the Montrose Museum and Art Gallery on Saturday 10th March 2018 and runs until 21st July 2018.